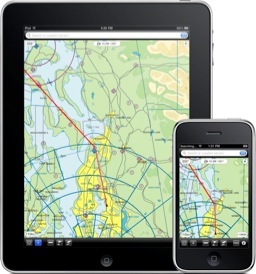 Aero Charts combines VFR+IFR charts and direct-to navigation in an easy to use and versatile package. At a fraction of the price we offer features normally found on aviation GPS devices that are worth hundreds or thousands of dollars! Created by an enthusiastic aviator with airplane, seaplane and helicopter ratings, including an instrument airplane rating. Our charts are vector charts that are derived from official FAA data and other government sources. The information on the charts includes Class B,C,D,E Airspace (including Special Use Airspace), Airways, Fixes, Holding Patterns, Navaids, Airports and Hypsography. We preprocess the data to make it continuous (i.e. no more having to flip sectionals) and to ensure consistency. You can move, zoom or rotate the chart using your fingers. Our chart looks great at any scale and rotation because we use vector chart technology. Our chart is rendered using VFR and IFR colors and symbology that is derived from NACO's official symbology. You can search for any feature (Airport, Navaid, place, etc.) using the search bar at the top. To get additional information about a feature of your interest just tap on it. This information includes FAA notes, Airway MEA's, and Navaid and Airport Communications. To measure the distance and find the bearing between any two points use the "ruler" tool. You can navigate to your waypoints using a Horizontal Situation Indicator (HSI) instrument. To see the instrument press the "PAGE" button. The instrument shows in a graphical manner your aircraft's heading (red arrow) as well as the desired track and cross track error (yellow arrow) when navigating to a waypoint. You can add, edit and delete waypoints. Hold finger over chart to add a new waypoint. For a more detailed presentation of our features see our User Guide.